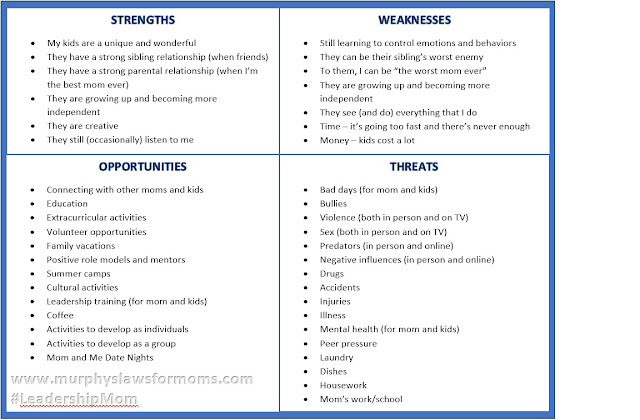 As a doting mother, there are hundreds of strengths that I could put up here for my kids. Their hugs, kisses, bedtime stories and prayers, the fact that they come to me when they're seeking healing from an injury (physical or emotional), the notes and drawings they make for me, their precious hearts when they try to help me or that they've learned how to use the Keurig to bring me coffee in the morning...I could go on and on. Now, here's the part where we get honest with ourselves. Yes, we love our kids and we love our family (or, hopefully, most of the time), but we are not perfect. Nor should we be perfect. As we analyze ourselves and our families, we have to face this reality. There are numerous strengths that I could put for my family on any given day. For example, today, my kids woke up and got themselves dressed without me having to nag them 50 times and then shoving breakfast down their throats while they were getting their snow gear (yes, we have to send them to school in full snow gear) on. That was a strength for today. But, overall, we have a lot of weaknesses (or things that stress us out) my kids' growing independence and the fact that they don't always want (or need) my help to get ready can be a weakness. It is an area that causes me so much stress when I could simply help them and get it done 10 times faster. But, it teaches my kids very little. This is the same for my kids' relationship with each other. Yes, they have days where they love each other and get along so well that I don't have to worry about what they're doing (although I still do) or what they're destroying. Yet, there are just as many days where one sibling gets mad at another because of something so trivial and then the other sibling retaliates by destroying something that the first sibling made or was trying to make (just think Lego City kits and the tremendous amount of time it takes to build the city only to have a sibling destroy it in five seconds). I could also dive into the relationship of siblings during car rides (long or short) and the "he/she touched me" argument...but we'll save that for another day. Yet, we also have a lot of opportunities to take the stress from our weaknesses away or to give us resources to rid us of the weakness altogether. We have each other and the thoughts, ideas, and positive comments that we can build each other up with. This isn't always other moms...it's everyone. A kind word, a loving action, or simply just nodding your head in agreement that hey, sometimes life happens...but we've all been there. We have the opportunities to fill our kids' lives with experiences (which do not always have to cost money). And, we have the opportunity to fill ourselves - as moms - with experiences that lift us up and train us as leaders (here's my plug for an organization VERY close to my heart: the Association of Junior Leagues International. Find your local League and get involved!). However, we have to watch out for - and be aware of - the threats that we can and will face. These are the things that can rip out the structure of our family if we don't guard against them. Some of these items are huge, but some may seem small or trivial. However, if we only guard ourselves against the largest threats and never watch out for the smaller ones, they will sneak in and take over so that we may just reach our breaking point. 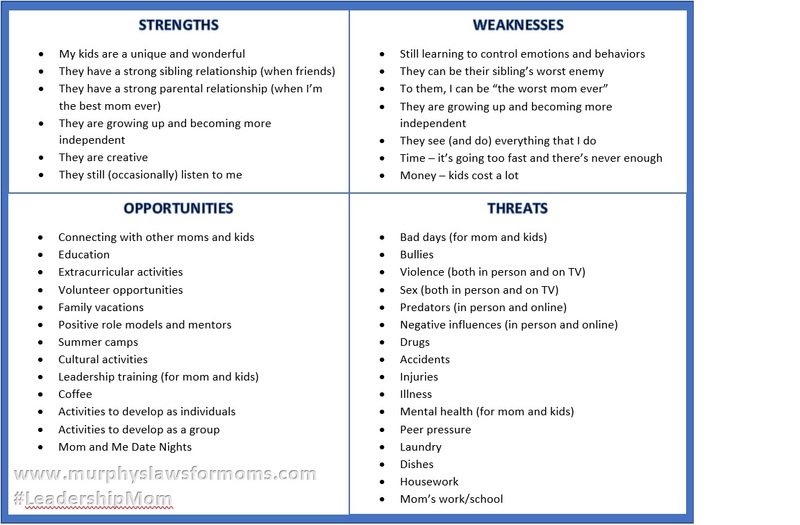 At the end of the day, what does this SWOT analysis do for us as mom leaders? It makes us aware of ourselves, our kids, and our family. From here, we can develop strategies and tactics to work towards our goals and fulfill our mission. We can use this to focus on the larger picture and think about where we've been and where we want to go. We can also understand our own individual family cultures that we may take for granted. And, we can better support ourselves, our kids, and each other. Please feel free to share your SWOT analysis and positive thoughts and ideas in the comments.